Grammy's Attic: Scared of Spiders! The image is from AuroraWings and if it isn't big enough for you to find the spider, click on the image to enlarge it. Or, if you're like me and you hate and fear spiders, just take my word for it that there's a loathsome, black, spider lurking on the jack-o-lantern. I colored with my ProMarkers and used white gel pen to add a few highlights. I cut the image by hand and added the printed sentiment (also hand cut.) I used a black card base, added the corner punched (Fiskars) strip of purple CS, and then die cut the black cat behind the image with a die from Cheery Lynn. Come to think of it, he doesn't look too happy about the spider either! I'm sure he's giving out a spooky yowl of warning. Super cute and love the gorgeous image. Great sentiment too! Have a wonderful day my friend. Super cute and fun! Love your card Connie! I had to take another look for the spider, but if you put it into context, it's HUGE! ugh!, I love your card, such pretty details and such fun with the "howling" cat die. 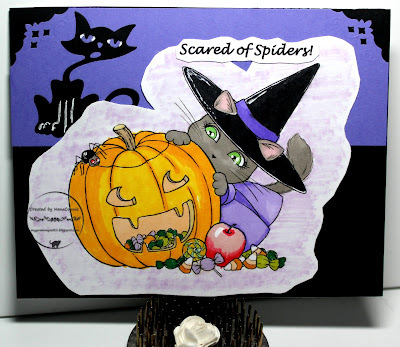 What a cute Halloween kittie on this Halloween card!! Its perfect for our challenge at Cards in Envy. I am not a fan of spiders either, do not like things that have more than four legs, kind of freaks me out lol! Wonderful card, some spookiness yet full of fun. Haha! This is just too cute to spook! Thanks for joining us at SugarPea Designs! I'm with you! Not at all a fan of spiders but LOVE them on Halloween cards. Your adorable kitty does look scared! Great coloring and we're glad you shared it with us over at Cards in Envy! Thanks for joining us for the SugarPea Designs Mix it Up Challenge! I agree! Spiders are the worst! Your card is adorable, thanks for joining us at SugarPea Designs! Oooh don't like spiders either!! Your card is just gorgeous.. those expressive faces! On both the kitties and the pumpkin! The spider on the pumpkin looks a bit fierce!! Loved visiting here for the hop, and thanks so much for your visit too! Awesome card design full of Halloween and Pumpkin Spice goodness! Thanks for sharing with us at the PaperGirls!